NEW YORK – The real value of elite players comes to light in the last four or five minutes of the considerable percentage of NBA games yet to be decided at that point. Too often this season, the Pistons have had to run Blake Griffin’s batteries to low just getting to those lonely moments. And they flirted with that peril again Tuesday night when Dwane Casey’s on-again, off-again bench sputtered 24 hours after combining for 60 points in Monday’s rout of Denver. Griffin scored 20 first-half points as the Pistons got off to another strong start to give themselves a cushion against the rebuilding – and only recent recast – New York Knicks, who started three players who a week ago were Dallas Mavericks, the net from dealing Kristaps Porzingis. But he had enough in reserve to make two critical baskets down the stretch of the 105-92 win – a triple off an out-of-bounds play that began with two seconds on the shot clock to boost an eight-point lead to 11 and a twisting, left-handed shovel shot in traffic as he was being tackled 37 seconds later. Griffin finished with 29 points, five rebounds and eight assists. It was a wire-to-wire win but never one that felt safe until Griffin’s big baskets finally extinguished the fire from a Knicks team given a boost from the three ex-Mavs, led by Dennis Smith Jr.’s 25 points. Casey was groping for lineups that worked whenever he had to rest his core players. 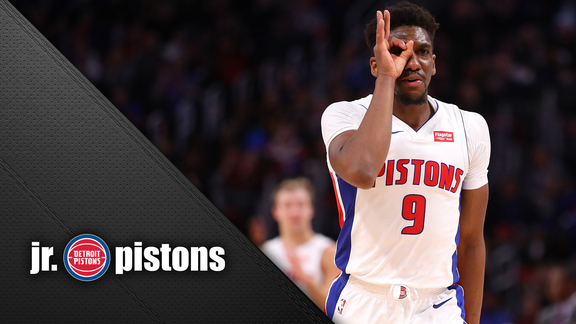 Langston Galloway, Luke Kennard and Stanley Johnson made one basket apiece in a combined 15 shots as the bench – missing Ish Smith, rested on the back to back as a precaution after missing 25 of 28 games with two bouts of a right adductor injury before returning last week – never got any traction. But Casey leaned on Johnson to contain the explosive Smith in the fourth quarter and found the right match. Smith was held to two points on 1 of 5 shooting with two turnovers in the quarter. With Smith throttled by Johnson, New York’s offense was held to 38 second-half points. With Griffin and the starters all called on for heavy minutes on the second night of a back to back, the Pistons needed that level of defense to overcome their own 42-point second half. The other significant component of that defense was Andre Drummond, who finished with a workmanlike 17 points, 16 rebounds and five blocked shots, two of them in the fourth quarter. That was increasingly the case as the game progressed after the Pistons knocked down 6 of 12 3-pointers in a 36-point first quarter. They would finish with just six more makes in their 22 3-point attempts over the final three quarters, scoring just 15 in the third quarter. Reggie Bullock accounted for nearly half of their triples, making 5 of 10 in a 19-point game. The Pistons have now won three of four games and two straight since a dispiriting Saturday loss to the Clippers, who overcame a 23-point deficit in the final 17 minutes. With only three games left before the All-Star break – starting with a Friday home rematch with the Knicks – the Pistons are set up to roll into the break with wind at their sails.